I’m currently in Berlin for the ITB – the biggest travel show in the world. Messe Berlin is so big it has two train stations! 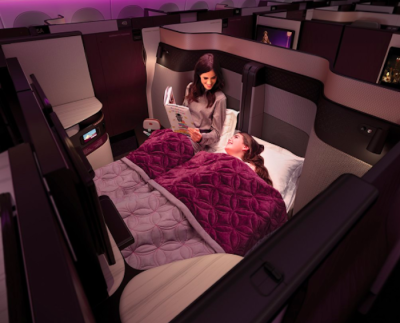 One of the main attractions of this year’s show is the new Qatar Airways Business Class seat, the Qsuite. 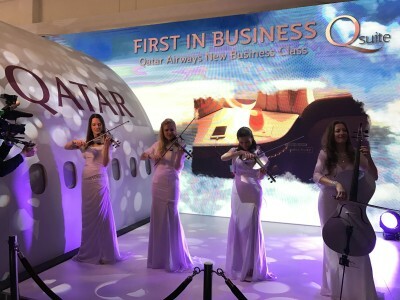 You can learn more about it on the Qatar Airways website here. 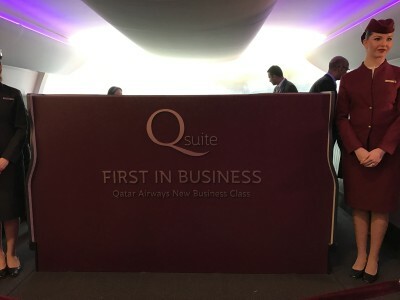 The Qsuite has been highly anticipated as it promised to bring, as Qatar describes it, “a First Class experience to Business Class” and I must say it did deliver. The overall display of the seat at ITB was pretty clever. In the morning it was covered with a white cloth and only at 11am the seat was revealed with ceremony. But even after the cloth came off you were still not able to see much! I was invited to the press conference at noon and had to wait until afterwards to finally be allowed in the Qsuite and lay my eyes on the seat. ….. is actually a suite. With a door. There is absolutely nothing like this available in business class at the moment. The Qsuite aims to caters for families, couples as well as individual travellers giving as much or as little privacy as desired. If a family of four or a group is travelling together the wall between the seats can be opened and the tables create a dining area for four. For a couple travelling together, the two beds form a proper double bed. Here is a picture from the Qsuite at ITB with the snack selection you will find on board. 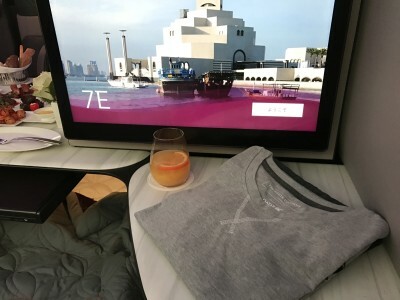 The White Company has designed pyjamas exclusively for Qatar which every passenger in the Qsuite will receive. We were also told at the press conference that the Qsuite will have a turndown service. The window seats are perfect for people travelling alone. You can close the door and switch on a ‘do not disturb’ button for total privacy. The next photo shows the side table in an A seat. As you can see underneath the table are several plugs including UK and USB, the remote for the entertainemnt system (Qatar has got 3,000 entertainment options) as well as the panel to arrange the seat from upright to flat. This is the dining table at one of the window seats. There is a lot of room for food and drinks. The new washbag on the side table is by BRIC’S. 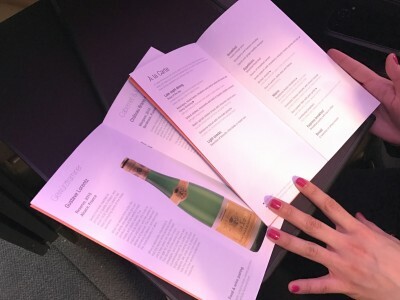 A quick look at the wine and food menu showed a great selection of drinks and food. Where will you find this seat? The current plan is to fit this seat to the new A350-1000 and Boeing 777-300ER aircraft currently being delivered as well as retrofitting it to Qatar’s existing Boeing 777 fleet. 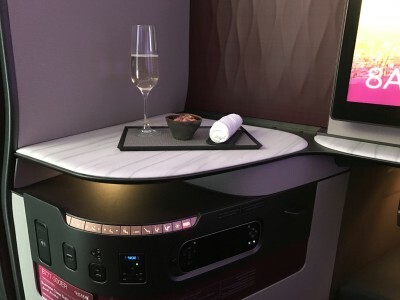 This will take the 777 from having the worst business seat in the Qatar Airways fleet (see Rob’s review here) to the best. According to CEO Mr. Akbar Al Baker there are also plans to replace the existing seats on the 787 and A380 fleet but this will require a modified design to the narrower width of those aircraft. The aim for those seats is to create total privacy like in the new Qsuites. 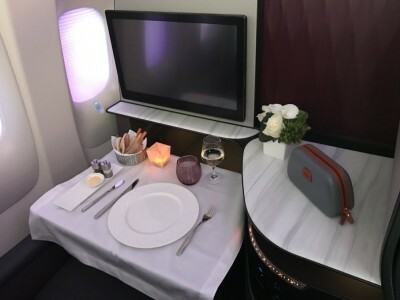 There are also plans to reinvent Qatar’s Economy Class as Al Baker believes that there should be the “same standard of additional comfort in coach class”. The Airbus A330 and A340 aircraft will not be refitted. The first plane to receive the new seat, a 777, will be flying between Heathrow and Doha. The start date was announced as June but Qatar has a track record of running late so don’t make any speculative bookings (Al Baker was blaming the delays on Airbus at the press conference…). Paris and New York will follow and if everything goes according to plan all A350 and 777 will have the Qsuite by mid to end of 2018. The Qsuite is a real reinvention of the business class seat. You can travel on your own and enjoy total privacy, you can travel as a couple and sleep in a double bed, or travel as a family and have a family dinner on the plane. All this, and you’ll earn Avios and British Airways tier points when you fly it as well! It will also be available for Avios redemptions of course. 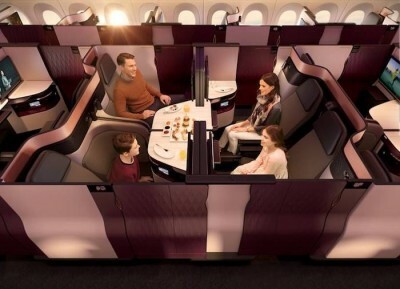 Qatar has got a global patent on the design so we won’t be seeing anything identical to the Qsuite on other airlines. 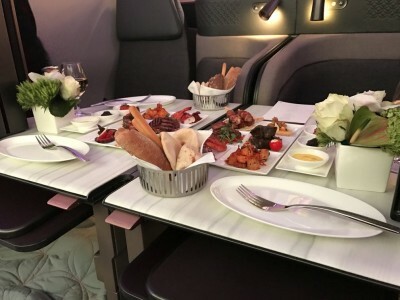 Qatar has definitely upped the game, putting pressure on their Middle East rivals and leaving the British Airways Club World – and arguably First Class – seats for dust. 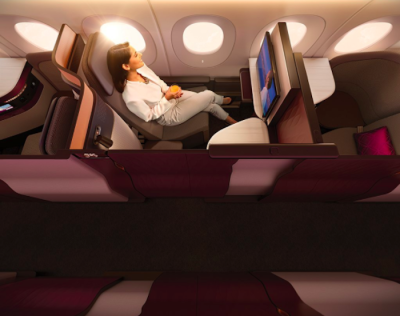 You can learn more about the Qsuite on the Qatar Airways website here. A welcome review. Ignore the hecklers. Certainly appears an innovative use of space. however perhaps this refers to the (relative) density of seating being slightly higher therein? It appears the paucity of F seats in the QR fleet encourages a focus on raising the quality of J. Long may it continue. It’s kinda smart as well that they keep just a few F seats. Do you think the panels between the middle 4 seats will be customisable? For instance could a person on one of the ‘outside’ middle seats keep their side and back partitions raised to maintain privacy. I am normally not a fan of Anikas reports – I find them flat and boring and tend to be quickly deleted. I am sure that many reports now on here are ‘paid’ in one form or another, as I am finding more and more articles are nothing more than an advert for x, y or z. Sadly this means far more are deleted. Deleted? You mean as opposed to printed out and framed? Do you have a special folder of your favourite posts? I always wondered how people justified all the offers on ink cartridges. I bought, and eBayed, some 3 years ago, mainly as a test. Worked ok (sold them as one lot IIRC) and was cheap Avios. To add (respectfully), that I am not normally a fan of Anika’s writing style – but it is very quickly growing on me. Quite enjoyed this article. Great. Just wish BA would upgrade their Business class offering !! “Just a door?” A door makes a huge difference depending on what you are used to. If you are working it is distracting having people walk by and it is also distracting when you want to sleep. When I fly QR, CX, AA etc with the herringbone arrangement I bring a length of string and a bulldog clip and rig the string between the little hook to hang a jacket on the forward section and the back section. I then ask for a spare duvet and make my own door. You can’t do that with BA CW aisle seats so I never sit there. Wonder what the new BA seat will be like. Despite not liking the aisle seats I do like the current arrangement. Great for couples and the windows seats are very private apart from meal times. You need quite a big bulldog clip, btw. The wall of the seat ‘capsule’ you attach it to is just under an inch thick. Thanks for the great review. In general it looks great. Presumably there is a divider between the centre seats if you’re not travelling with someone you know? I can’t see any armrests – is that true? Your picture shows what looks like a contactless payment point underneath the table….. any ideas what that’s for? Paying for duty free…? The “four bed suite” is certainly innovative… but I’m not sure I’d want to be on a flight where there is a party of four sitting together like that. The people opposite are still a good distance away, so would need to talk quite loudly (as opposed to if you are talking to someone next to you). Furthermore with the ability to close the doors, they could easily become oblivious to their surroundings and forget to keep their voices down…. I suppose that’s what the headphones are for I suppose. Minor quibbles, though, for what looks like a really great product. 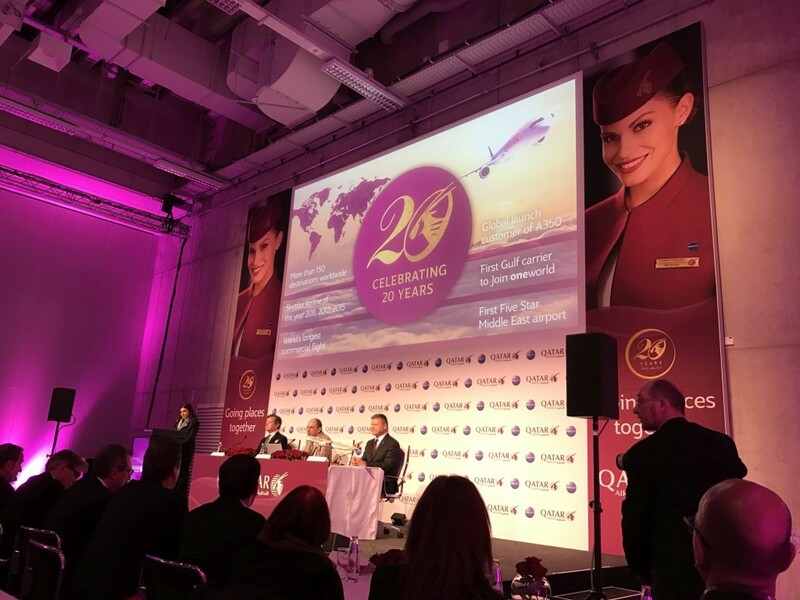 Qatar is hands-down my favourite airline and it looks like it will stay that way for a few years to come! I think its a tacky solution, trying to be too clever by far. Well, I for one, liked the review and would certainly be keen to try it out. Have experienced the Emirates, Cx, BA , Finnair business products. We tolerate BA due to the 241 redemptions , but like the others better. It means that most widescreen tv content (at 1.77) has to be either stretched or letter-boxed. And widescreen films (1.85) and scope films (2.35) have to be letter-boxed to a greater degree. Do Qatar censor films as Etihad do? Yes. I’ve missed key scenes in some films that made me wonder what everyone else was talking about. I’m still not interested in Dubai full stop. Flying QR in J tomorrow to BKK from AMS. I will enjoy the onboard bar once again on the DOH-BKK leg..
Good review Anika. 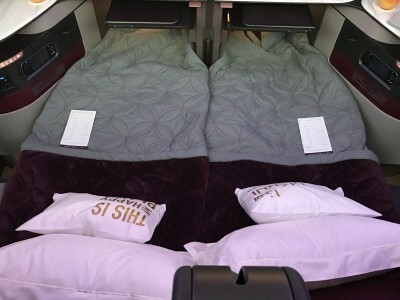 Did Qatar or His Excellency explain if and when the retrofit will happen with the fleet particularly 77L since we have the flight in September to AKL and was hoping we might get to see this suite? Hi Rob, I notice that under the table with the controls and plugs you have what seems to be a contactless card panel (RFID), any ideas what this may be used for? Another nail in the Amex 241 Avios coffin. Thanks Anika. Enjoyed the review and also the insight into the unveiling ceremony as I’ve never been to a travel fair. On a side note, I think some of the comments were slightly personal and borderline offensive considering this was let’s not forget just a review of a seat!